Oh, man! Isaac Thorne has created a work of pure terror! I have a phobia of public restrooms. 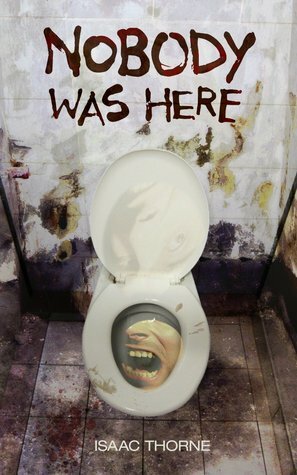 This story proves that I should never step foot in a public restroom again, and neither should you. I wanted to puke a few times throughout this story. Warning: Do NOT eat before reading this story! Isaac Thorne’s description of the bathroom is incredible! I could see the filth and germs all over the toilets and stalls. Reed takes his wife (Rita) and his son (Chase) on a cross-country trip to the Gulf. Chase gets hungry and Reed has to use the restroom, so they stop at a Big Burger. Reed almost hurts himself trying to pee. That is when a stranger in the next stall starts laughing. The junky tries to mess with Reed, but Reed is not in the mood for any games. I will stop there because I don’t want to give anything away. This is a crazy story about two men and a disgusting bathroom. The things that take place in that restroom are not for the squeamish. It is a story about being in the wrong place at the wrong time. I can still see the man’s nasty teeth and skin. I sick just thinking about it! I highly recommend this short story to fans of horror!